The invoice is sent by the seller (i.e., payee) to the buyer (i.e., payer) either manually or in electronic form. The invoice is then transmitted from the seller to the seller's bank. The buyer's bank receives notice from the seller's bank and informs the buyer. In an electronic exchange, the buyer can display or download the invoice through an Internet banking portal or a file transfer channel. The buyer then performs a reconciliation check between the data in the invoice received from the seller and the data in the purchase order previously sent to the seller. Possible disputes must be resolved before the buyer gives the payment order to his bank. 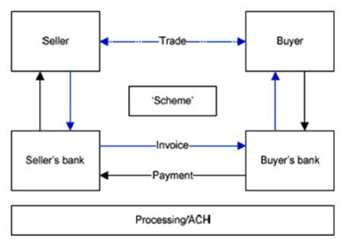 Payment is executed through payment system from the buyer's bank to the seller's bank. The buyer's bank account is debited for the equivalent amount. The seller's account is credited with the payment and the seller completes the reconciliation process.